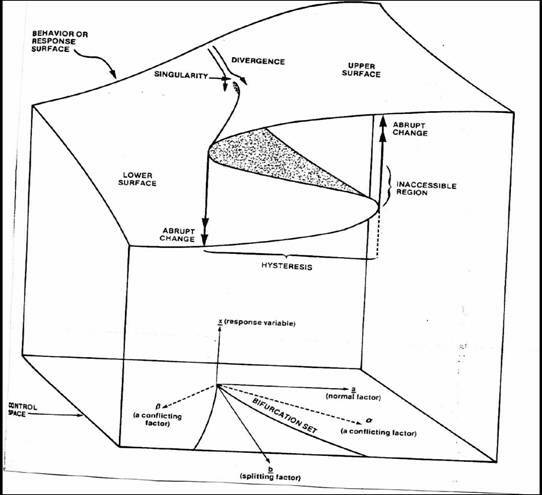 While I struggled with the advanced math, the concepts and applications of catastrophe theory were much easier to grasp and had significant real-world implications, including modeling asymmetrical shifts in animal and human behavior. One example that Prof. Ferguson cited was that of a man approaching a hostile dog chained to a post. The dog growls but does not bark until the man gets within a certain distance — say, 10 feet. At that point, the dog shifts suddenly from mere warning to outright attack. However, if the man takes one step back, the dog does not suddenly settle back down into warning behavior. Instead, the dog continues in attack mode — active barking and snarling — until the man has retreated a substantial distance farther than the point at which the attack mode commenced — say, 20 feet. This particular model has been used to describe a variety of human behavior aspects as well, such as abrupt transitions in stock market behavior (crashes and rallies). What this diagram points out — if you look very closely at the very bottom — is that there is some kind of “splitting factor” that promotes this behavior (the bifurcation of the cusp when projected down to 2 dimensions). The high the splitting factor, the greater the gap between the two states, and the greater the asymmetry between transitions from one state to another. What does all this have to do with Obamacare? Well, for most of the three years since Obamacare was passed, the majority of the population has disapproved of it (see the second chart here at Real Clear Politics), yet that didn’t really translate into significant public anger or political action, beyond the 2010 mid-term election results. In fact, Sen. Ted Cruz’s filibuster attempt and the House’s short-lived shutdown appeared to push public opinion against those actors rather than against Obamacare. But that has changed, and dramatically, with the law actually going into effect — and Healthcare.gov going live — back on October 1st. For the first time, Obamacare got “close enough” to significant portions of the American electorate to trigger a sudden shift in actual emotional response from a generic disapproval to outright hostility. I believe that Obama and his Administration — lulled, perhaps, by the more passive dislike evinced by the public up until now — have been caught genuinely off-guard by the dramatic change in public opinion in a month’s time, not just towards Obamacare but towards Obama himself. I believe that shift in opinion in fact represents a ‘catastrophe’ — that is, an abrupt transition from one state to another– brought on by the realities of Obamacare hitting home. If this model does, in fact, apply, then the question is: what is the splitting factor, and how significant is it? Remember, the greater the value of the splitting factor, the harder it is to reverse the catastrophe, that is, to back-track enough to cause a transition back to the previous state. In this case, what will it take to get the public to accept, or at least tolerate, Obamacare again? The sticker shock that millions of Americans are facing when they seek to acquire ACA-approved insurance policies. The disastrous launch and continued disastrous performance of Healthcare.gov and many of the state exchanges as well. The growing realization that the ACA is going to have negative impacts on doctor and hospital access, and that many millions more of Americans with healthcare policies through their employers are likely to lose coverage that they like and/or fact substantial sticker shock. Now, Obama has tried to minimize these splitting factors by delaying or changing implementation of certain aspects of Obamacare. But short of delaying the entire ACA for a year or two, there isn’t that much more he can do to reduce these splitting factors — hence the abrupt shift in Americans’ reactions and opinions. If anything, these combined splitting factors are going to increase over the next 12 months, widening the opinion gap between the prior state and the current one (i.e., even greater dissatisfaction) and widening the back-tracking required for a shift back to more passive tolerance of Obamacare. In light of that, Obama’s planned “PR blitz” for Obamacare is like putting a band-aid on a gaping wound. It will do little to move the electorate far enough “away” from Obamacare’s actual impact to cause a reverse ‘catastrophe’ in public opinion back to the merely dissatisfied acceptance. Furthermore, his announced decision that “We’re not repealing it as long as I’m president” shows an unwillingness to reduce any of the splitting factors. In short, things are likely to get worse for Obamacare, for Obama, and for the Democratic Party as a whole. Once again, this is just a model, not reality (always a useful thing to remember when dealing with models). But I think it does explain the dramatic shift in public opinions over the past few months, and I suspect it gives us a good idea of what lies ahead. The preference cascade is usually based on discovering among your peers that it’s OK to feel or believe a certain way, while this model has more to do with one or more provoking factors pushing you over the edge, so to speak. 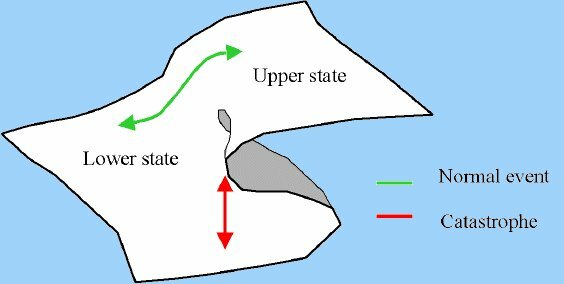 In this case, when you’re modeling a population instead of an individual, a preference cascade can be a forcing factor pushing more people over the edge and a retarding factor in trying to drag them all the way back to the reverse catastrophe spot. They work hand in hand! I’d also note that since a majority of the public has disapproved of Obamacare pretty much since its inception, it is not as though a lot of people thought it was impermissible to disapprove of it. On the other hand, the shift in Obama’s poll numbers in the past few months may well indicate a true preference cascade. In any case, more bad news for the Left, all the way around. ..bruce w..
P. S. Click here to see all my Obamacare posts. [UPDATED 12/11/13 – 0819 MST] Added some text for clarification. Webster is Principal and Founder at Bruce F. Webster & Associates, as well as an Adjunct Professor of Computer Science at Brigham Young University. He works with organizations to help them with troubled or failed information technology (IT) projects. He has also worked in several dozen legal cases as a consultant and as a testifying expert, both in the United States and Japan. He can be reached at bwebster@bfwa.com, or you can follow him on Twitter as @bfwebster.